UPDATE (1-21-2015): Read the latest updates on this promotion here. 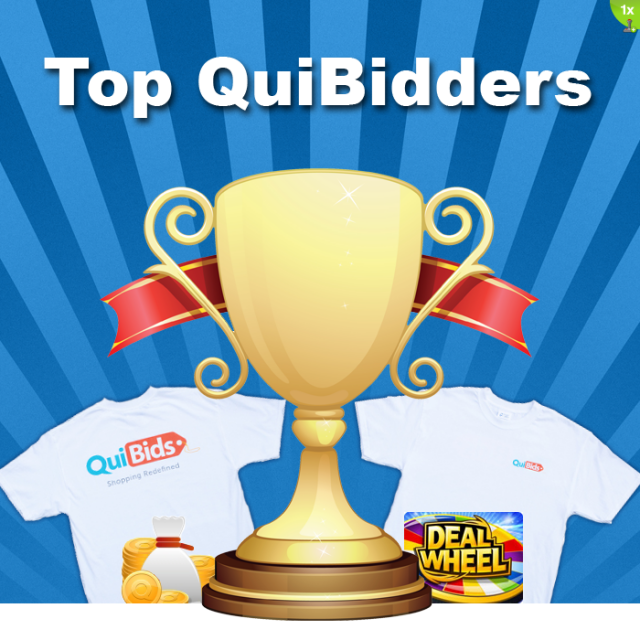 The Top QuiBidders Leaderboard rules have been updated on November 1, 2013. See new the updates here. After we announced our new Top QuiBidder contest, we realized that it’s a lot to unpack. Here we’d like to do that, specifically by talking about why we set the monthly Top QuiBidder contest up in the first place and offer some tips on how to use it to your advantage! We’d often notice on our Facebook and Twitter accounts that our own customers would beat us to the punch when it came to helping out others via social media (See Commandment #5 on our Ten Commandments of QuiBids Social Media for an example). Over time, that help piles up into hours spent acting as an effective, self-appointed agent of our site, so we wanted to recognize and thank these customers for the hard work they put in, particularly on Facebook. In addition to rewarding helpful customers, the Top QuiBidders contest will also incentivize thoughtful sharing for how to make our site a better place to bid and to shop (see our recommendations for good sharing practice below). We want our social media accounts —the QuiBids Facebook page, in particular— to be a forum open for the sort of discussion that shares and compares opinions and provides useful feedback for our service. To be eligible for the rewards, you must opt-in to the Top QuiBidders promotion by clicking the Login button when first accessing the app. You can’t simply score points and rise up to the peak of the Top QuiBidder Leaderboard by sheer volume of comments and posts alone, so we recommend aiming for quality over quantity when you engage with us and other customers on Facebook. Here are six easy ways to do that but be sure to check out the How to Earn QuiBidder Points section of the previous Top QuiBidders blog post first. In the past, we’ve used our Facebook page as a barometer of sorts. It’s a good way for us to gauge how our customers feel about certain site features and practices. Asking us —and your fellow customers— good questions will elicit good responses, and those translate to QuiBidder Points! Did you win a gift card that you used to purchase something for your cute kid, cute pet cat, cute pet dog, or any other person or animal that you love that makes for a good image? Appeal to the public’s “dawwwwww” reflexes and post it on the our Facebook page! You’ll find yourself with a bucketful of likes. Be sure to provide details in the images description like how many bids you spent, the ending auction price, how much your kid/pet/family loves the product, etc. On a slightly more serious note, take advantage of the power of the visual to create something —a photograph, a drawing, a mixed-media something Q related— that resonates within other QuiBidders and you’re sure to inspire a ton of engagement. If somebody has a question that they’re asking us on QuiBids’ Facebook page, odds are pretty good that more people are wondering the same thing. Directing confused customers to useful blog posts or relative QuiBids 101 articles will endear them to you in flocks! 4. What is notable activity anyway? 5. Mind your Top QuiBidder limits! You’ve only got a limited number of posts, likes, and comments to post on QuiBids’ Facebook each day, so don’t tire yourself out trying to post like crazy. Another thing that’s important to mind is your placement on the board. Save for pride, there’s really no difference between position #1 and #50 on the leaderboard, so there’s no sense in exhausting yourself by trying to post something brand-new and innovative every single day. The way the algorithm that assigns QuiBidder Points works, checking in on a daily basis —even if it’s something as simple as a like or a little comment— plays into your favor big-time. 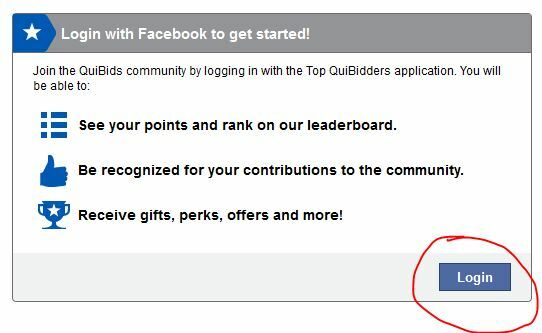 So be a regular on the QuiBids Facebook page, whether that’s just liking what other people say or cheering them on with a friendly comment or two. Read about more ways to enhance your experience with QuiBids via social media.